The MIAA has deferred the integration which was supposed to take effect beginning Jan. 15 to give way to the papal visit on Jan. 15 to 19. For me, this is a good thing because it means you and I, common people, don't have to line up and wait for our turn to pay for our terminal fee. It would facilitate smooth boarding. So, thumbs up for that. 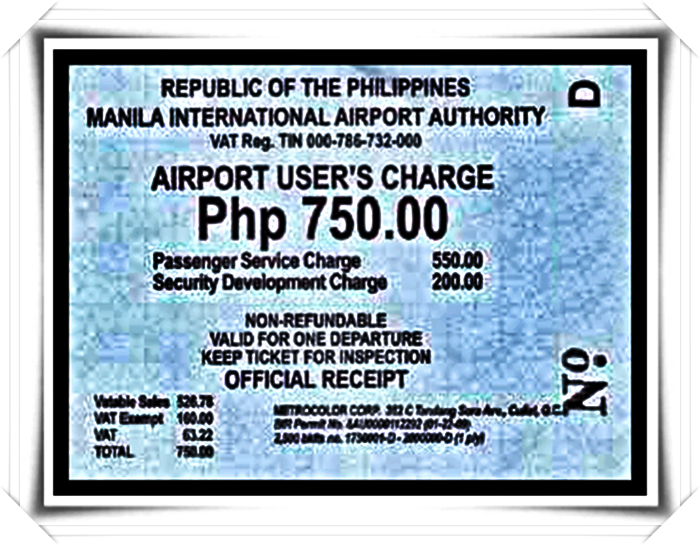 The implementation of the memorandum circular seeking the integration of the terminal fees with the cost of plane tickets has likewise been delayed in September last year due to opposition mainly from groups of overseas Filipino workers who because of the new policy would need to pay the terminal fees and line up for refund afterward. OFWs along with Muslim pilgrims, and Filipino athletes are exempted from paying the terminal fees. To avail themselves of the exemption, workers have to present their exemption certificate while pilgrims and athletes must present airport authorities proof of the endorsement of the National Commission on Muslim Filipinos and Philippine Sports Commission, respectively. Those buying their tickets online and overseas may get a refund at the Ninoy Aquino International Airport afterward.